Today I received another package from England. 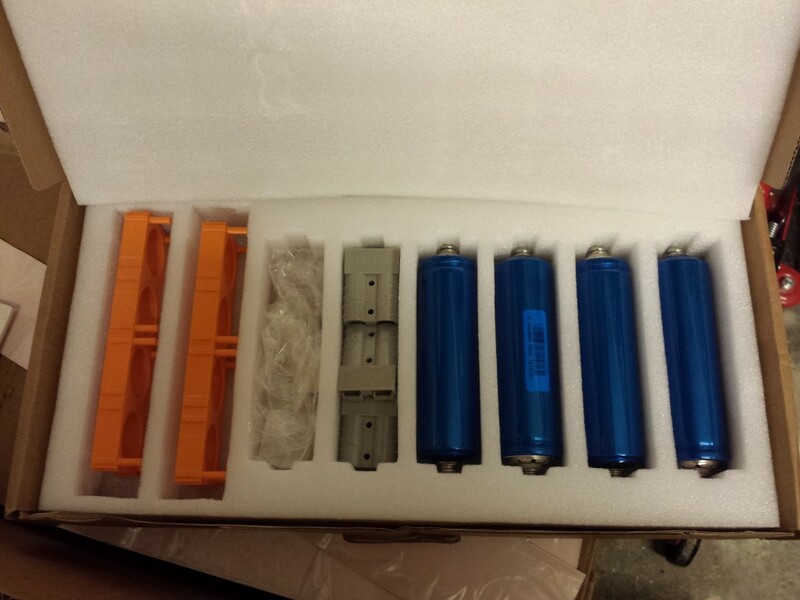 They are 4x 3.2V 10Ah batteries. Same kind as the batteries used for the propulsion (LiFePo4) only smaller and round. 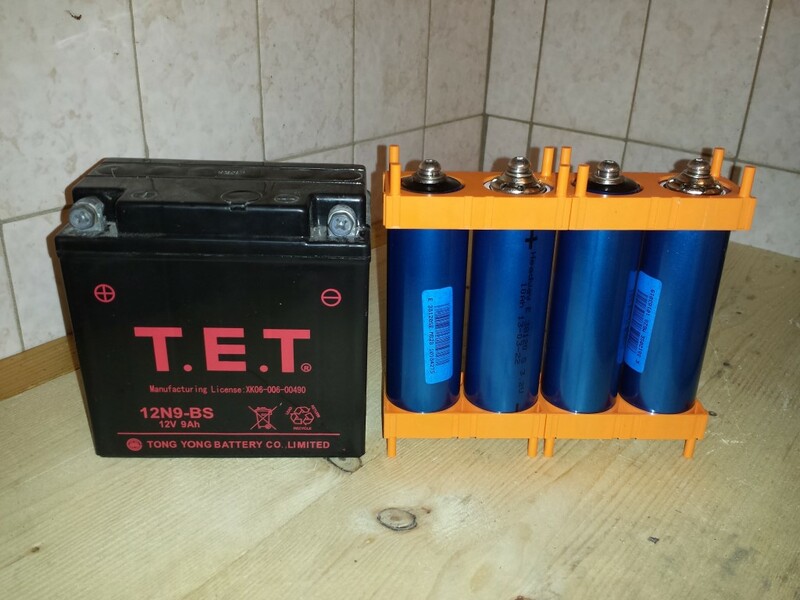 As replacement for the original 12V battery. Everything's included to put it together and connect in series. 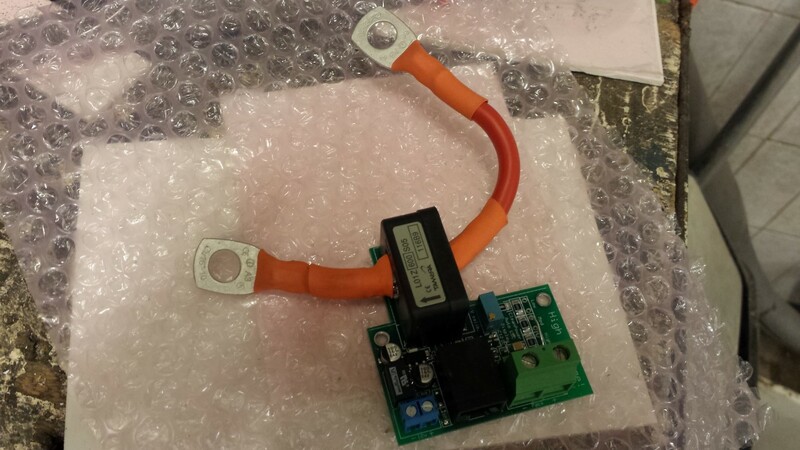 Also 4 50A connectors to be able to easily unplug the charger and DC-DC converter. All pretty hard to get here in the Netherlands. Here you can see some comparisons with the original battery. 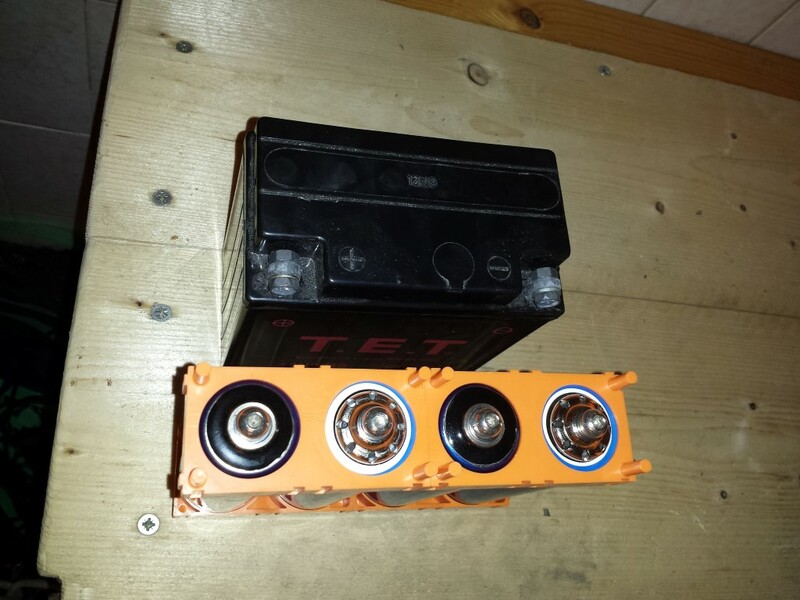 The original one is 12V 9Ah, the new one is (in total) 12V 10Ah. Weight differs quite a bit too, original is 2,8 kg. This only 1,4 kg, so half of the weight. It just doesn't fit in the space I had in mind, but can place this anywhere really so it'll be all good. Can also make a square of it or an L shape. The video is done, really like looking back at it. I instantly get the smile back again. Also very happy with that camera that I placed on the quad bike, it gave some great footage. Can see everything working and turning. It was really great, hopefully with some more power soon. Well that was a nice day again. The first testride is done and it was definately a success. Made a lot of pictures and filmed it. You'll have to be patient for the video though, don't think I can get it done anymore tonight. This morning I first charged up that 2nd battery, then I connected all of the cables. Then I setup the controller to get some more power out of it. Attached my other new toy as well. Can already tell that this produced some very nice video. And then it was ready to go outside for the very first time. I was able to ride it outside right away. 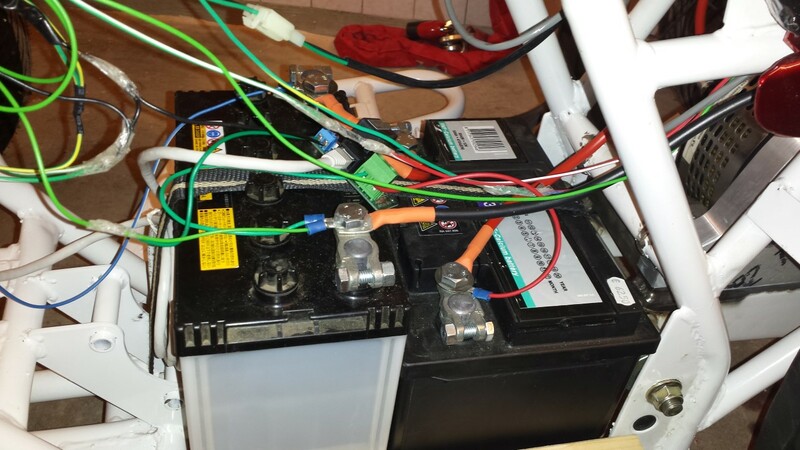 I did already notice that I was getting less power out of the batteries than I was hoping for. But it was still a lot of fun. The whole time I was riding with a big smile. This is what's called the 'EV grin'. It's just a shame that it's going up/down hill here. Down hill it went pretty fast but up hill it went rather slow. Especially at the end when the batteries were pretty much empty I had some moments where it wouldn't get moving at all anymore. But I could still push it, jump on it and hit the throttle. Once it got moving I was able to get up hill again. But at the beginning when the batteries were still full it was really great. Could definately feel the power of the electric motor quite good already while not really having much power available yet. Think it was about 1kW, couldn't get more out of those starter batteries. I set the controller to 25V 120A (so 3kW) but most of the time I've seen between 30-60A. Just a small pulse of 100A in the beginning. But I definately enjoyed it. Top speed I couldn't see during this test but I think down hill it was around 30 kmh, up hill 0-15 kmh. Here are some more pictures. Handsfree, really? Was quite interesting to keep an eye on the display. Had to wait sometimes for the voltage of the batteries to rise back up again. It was only at 20V suddenly. After a minute or so it was back up to 24V. But the batteries were already depleting anyway. No reverse just yet so I had to do this quite often. For the next testride I will have a reverse. But then the batteries really were empty so I needed some help getting back up. 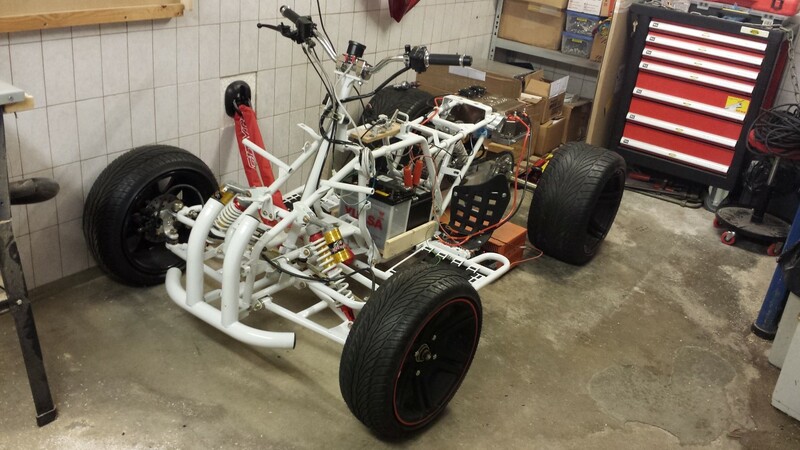 Unfortunately the batteries have to go back into the cars, otherwise I'd play around with it for a bit every day. But it was definately a great moment again. 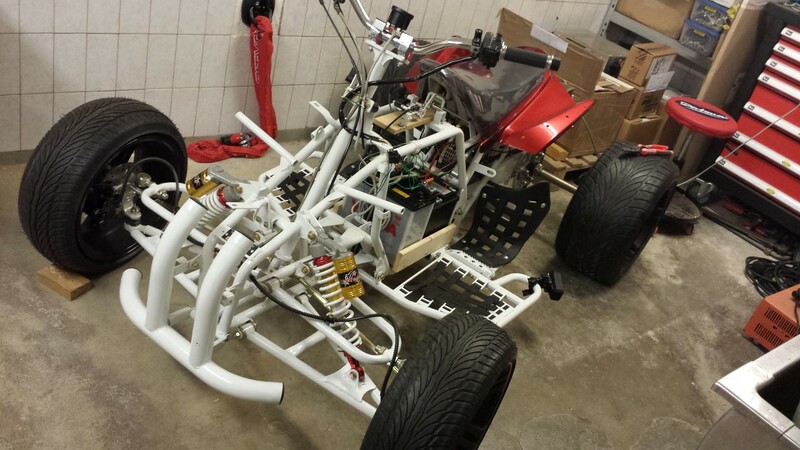 The next testride will be with the lithium batteries once they're attached onto the frame. Will probably still take a while though. The video will come, just still have to edit it a bit and don't really have much time tonight. It'll probably come tomorrow. 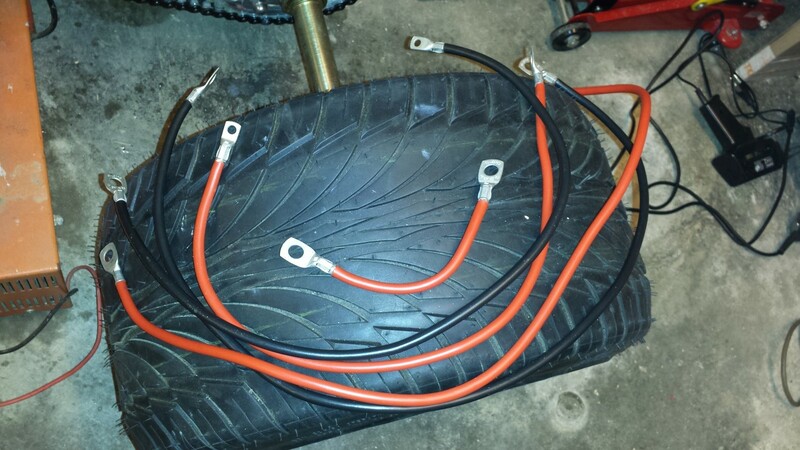 Today I made some thicker cables so I can test with some more power tomorrow. Top speed won't really be high with just 20-24V but will probably have some more torque since I can push more amps through these cables. 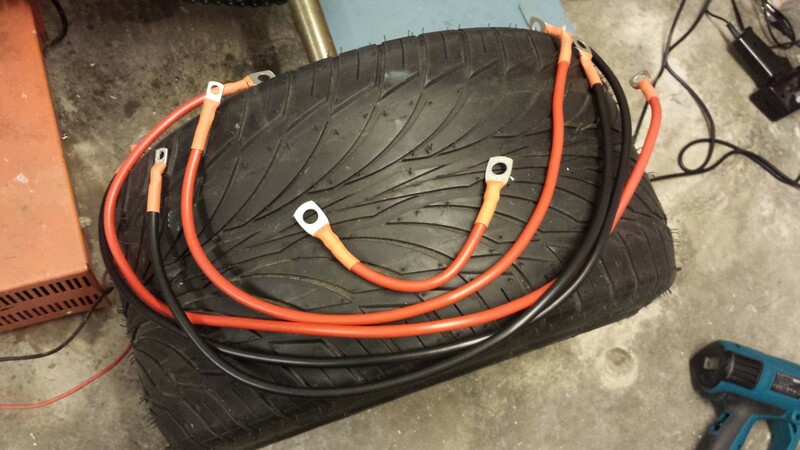 Was quite some work to make them the right size and to put the cable shoes on them. But I bought an hydraulic crimping tool a while ago specifically for this so it went reasonably well. Also put some heat shrink around the cable shoes. Might be using these cables more often when I'm bored. Then I had a whoopsie moment. Was planning to place the sensorplate for the display on the shorter cable. But I already put both cable shoes on it so I couldn't get the cable through the sensor anymore. Since I didn't have any extra cable shoes of this size I just cut the cable, placed the sensor and soldered it. I just couldn't get the cable hot enough so it's pretty badly soldered. Only the outside really, on the inside there's no solder and the wires are just pressing against eachother. For longtime use I definately wouldn't accept this. But just for testing tomorrow it should be fine. The 2 car batteries are also on, I'm fully charging one of them now. Tomorrow I'll just have to put a strap around them to keep them in place. The Chinese really did make a good frame. 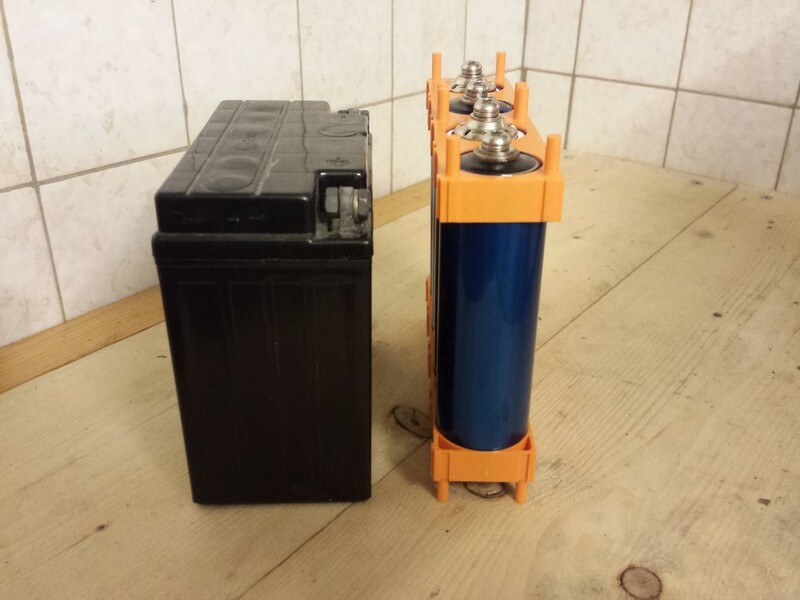 Both of the batteries just fit exactly in width. There really is no space left between them, not even 0,1 mm I think. Like they knew I was going to do this when they welded this frame. So tomorrow will be another exciting day hopefully without problems. 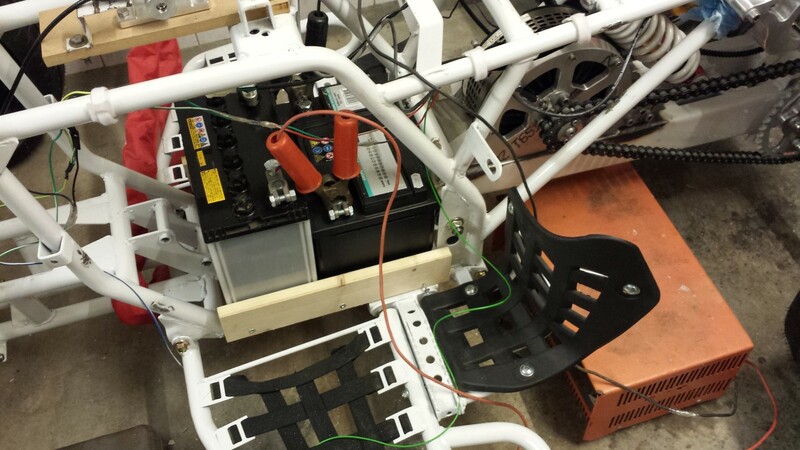 In any case the quad bike's ready, just still have to fully charge the 2nd battery tomorrow and connect the cables. See here the biggest moment of the project up untill now. Just on low power ofcourse with such small wires, 20V 50A maximum so 1kW. But I didn't really see 50A, think the wires are just too small for that and the 9Ah battery of the quad bike was empty pretty quick. I also saw that the wheels are quite unbalanced. It could be many things though so I don't know what is causing it exactly. 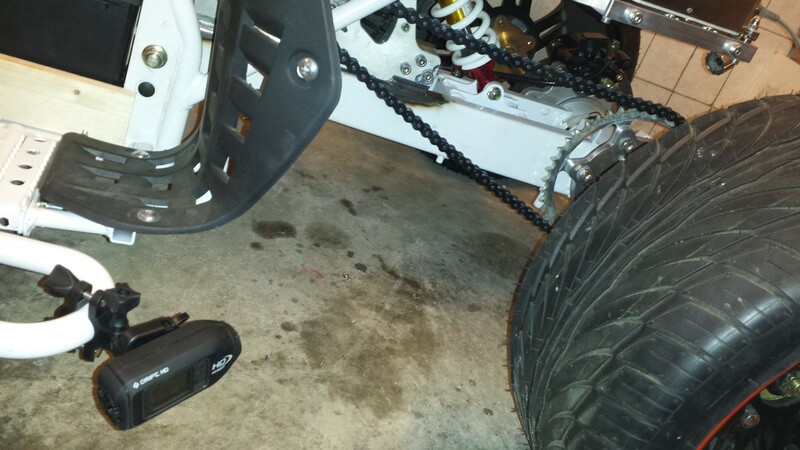 Could be that the rear axle is bent just a little, common problem with Chinese quad bikes. Could also be something with the bearings in the bearing house. And the wheels themselves aren't balanced yet either. It's also a straight axle and there's no weight on it, could be that it's bent a little because of that. 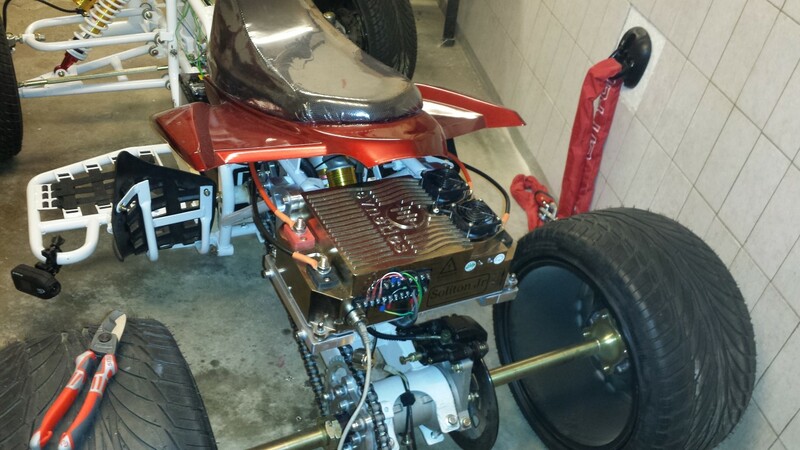 Tomorrow probably with some more power and hopefully a short testride.